Two-time PGA TOUR winner Kevin Streelman’s grip could pass for just about any pro’s these days. That is, it’s a little on strong side. It’s a common theme as pro golfers – like their amateur counterparts – chase extra yards like dogs after stray cats. As a 5’10”, 175-pounder in a game full of ever-larger men, Streelman can use every inch he can find. He doesn’t, however, sacrifice much if any accuracy in the search. In 2013 and ’14, he ranked among the tour’s top 25 in fairway percentage. Streelman’s left hand is clearly turned to his right on the handle, with the back of his hand and forearm facing forward. The right hand is closer to a classic neutral position, though still slightly strong. 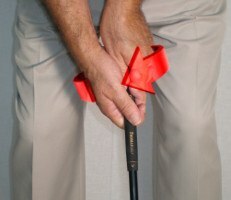 This is a very comfortable, functional way to grip the club. 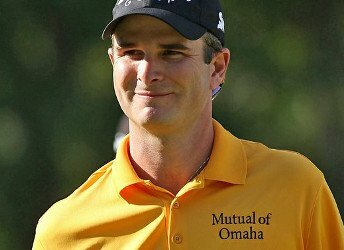 Kevin Streelman’s grip with the putter isn’t out of the ordinary, either. Reverse overlap, nice and neutral with the hands, extremely light pressure. 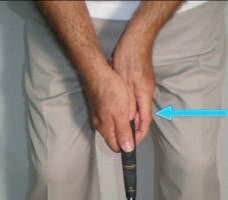 His hands do appear a little farther apart than most pros’, though, while his left wrist may be in a more “uncocked” or “unhinged” position. When putting, Streelman strives for feel. That’s why his grip pressure is so light. 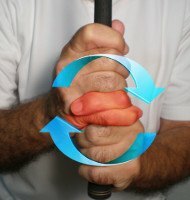 This allows the putter to swing naturally back and through, whereas a firm grip tightens the forearms and creates a jabby, restricted stroke. Keeping your grip pressure light is especially critical on fast greens. If you struggle to stop putts from racing past the cup when the greens get slick, take a cue from Streelman and lighten up.